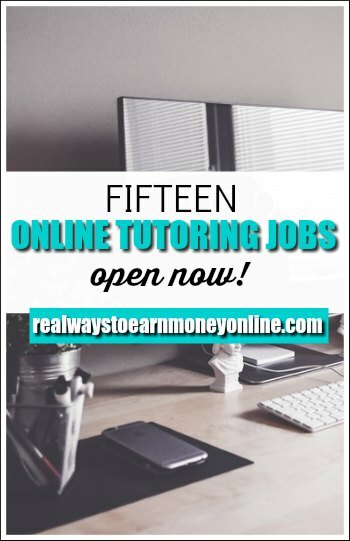 Online Tutoring Jobs: 15 Companies To Apply With Today! Published October 19, 2016 By Anna T. This post may contain affiliate links. Regardless, I only recommend sites I've researched and/or used and trust. There are so many different ways you can make money from home in the education field! And today, I've done a ton of research to list the best online tutoring jobs I can find for your reference. Online tutoring tends to be flexible and lucrative as far as work at home jobs go. However, all companies are not created equally. Some companies are going to require you've had past experience and some do not. To help you with this, I've divided the companies up based on experience required. This way, you'll see at a glance which opportunities could work for you without having to pore over the list in it's entirety. One thing to be mindful of is that all of these companies (with the exception of this one) require you either have a college degree, or be in the process of acquiring one. I've tried to note the specifics on that next to each listing. #1 – Chegg Tutors – Read Chegg Tutoring Review – Open worldwide. No experience needed, but you must be currently enrolled in a university or prove that you have been in the past. They require copies of your diploma and/or student ID cards to confirm this. #2 – Instructional Connections – US only. A minimum of a Master's degree is required, with some subjects requiring more than that. They also prefer some experience in online education, but it does not say this is required. #3 – Tutor.com – Open to US and Canada. They don't require past experience, but you must be an expert in any of the tutoring concepts you select. Also, at minimum you must be a sophomore in college. Some subjects do require a college degree. #4 – Skooli – If you have at least a Master's degree or ESL or other language qualification, then you may be accepted to tutor for Skooli. #5 – Elevate K-12 – US only. Must have completed at at least 13 years of formal education to be considered (12 years of school plus one year of college). You also need comprehensive knowledge of subjects. #6 – Yup – This company offers online tutoring jobs in math, chemistry, and physics. This is one of the few that does not require past experience and also does not require a college degree. However, you are tested on these subjects to ensure your knowledge is up to their standards to begin tutoring. #1 – VIPKid – Open to US and Canada. Applicants must have any “formal” or “informal” teaching experience such as mentoring, tutoring, coaching, or alternative education as well as a bachelor's degree in any field. This is primarily ESL teaching. #2 – Aim4A – Open worldwide. Minimum of a bachelor's degree is required. Must also have some past teaching experience. #3 – Brainfuse – US only. Minimum of a Master's degree is required. Must have some past tutoring or teaching experience. #4 – PrepNow – Two years of teaching or tutoring experience is required, along with at least a bachelor's degree. They also want to hire people who got good scores on SAT and ACT tests. #5 – Revolution Prep – Past teaching experience along with a bachelor's degree is required. This company claims they only hire 2.2 percent of applicants, so they are quite selective. Pay is $20 hourly+. #6 – Pearson – US only. The exact amount of education and experience you need depends on the type of tutoring you're doing, but positions typically require some type of degree and/or teaching or tutoring experience. #7 – Tutapoint – Read Tutapoint Review – US only. Requires at least two years of past tutoring or teaching experience before they will consider you for their online tutoring jobs. #8 – TutorVista – Possibly open worldwide. Must have a Master's in the subject you choose to tutor in. They also prefer some past teaching experience. #9 – TutorMe – Possibly open worldwide. All applicants must have previous tutoring or teaching experience, mastery of subjects tutored and be enrolled in or graduated from an accredited university. #10 – MathElf – Possibly open worldwide. This is an online math tutoring job. You must have at least two years of math teaching or tutoring experience. All work is done from your iPad. I have some more work from home education companies listed here if you're interested. And if you are looking specifically for current online tutoring jobs, FlexJobs has leads posted regularly in this department. This is a membership-based, subscription jobs site that I use and trust. They guarantee all their listings to be scam-free. You can read my full review of FlexJobs here if you'd like to know more about the site. Good luck, and please comment below if you have any experience with the above companies, or if you'd like to suggest any alternatives! What do they normally pay? Thank you so much for this detailed information.